Last month, a science story spread across the internet that seemed more suitable for Halloween than mid-September: Researchers had found that injections of young blood appeared to protect old patients from age-related illnesses. The controversial discovery stemmed from a growing realm of scientific research aimed at transforming the human condition. Doctors involved hope to help people artificially boost their intelligence, gain new athletic abilities and maybe even live forever. Transhumanism, the philosophy or intellectual movement underlying this type of research, teaches that humans aren’t done evolving. Transhumanists look at scientific advancements such as gene editing or robotic limbs and see the promise of a future with longer lives and much less suffering. Although transhumanism began as a mostly secular movement, people of faith, as well as organizations such as the Christian Transhumanist Association, play a notable role in this movement today. Religious transhumanists draw on teachings related to bodily resurrection or rebirth to explain their involvement, arguing that revolutionary science benefits from a stronger moral compass. Religious transhumanism has been criticized by both secular and religious people, who see a contradiction between belief in a higher power and passion for extreme human-led medical advancements. Prominent transhumanists in Silicon Valley, including Elon Musk and Peter Thiel, are bringing more attention to this intellectual movement. Here’s a list of the people and organizations that can help you cover the intersection of transhumanism and faith. Read “Should we live to be 500? Christians and secularists come together over transhumanism” from Religion News Service on Sept. 5, 2018. Listen to “Spiritual Machines” from the Ministry of Ideas podcast on Aug. 31, 2018. Read “Want to live longer? Consider the ethics” from The Conversation on Aug. 31, 2018. Read “Should we live to be 500? And other questions Christians are asking in Nashville this weekend” from The Tennessean on Aug. 24, 2018. Listen to “The why factor: Immortality” from BBC World Service on May 21, 2018. Read “Thinking Outside the Old Religious Box: Transhumanism is complicating the sometimes antagonistic relationship between faith and science” from Slate on March 21, 2018. Read “Inside the first church of artificial intelligence” from Wired on Nov. 15, 2017. Read “Transhumanism and Christian Orthodoxy: Where Do We Draw the Line?” from Christ and Pop Culture on April 20, 2017. Read “God in the machine: My strange journey into transhumanism” by Meghan O’Gieblyn for The Guardian on April 18, 2017. Read Homo Deus: A Brief History of Tomorrow by Yuval Noah Harari, which was published on Feb. 21, 2017. Read “Google’s long, strange life-span trip” from MIT Technology Review on Dec. 15, 2016. Read “When Cyborgs and Christians Compromise” from Inverse on Sept. 25, 2016. Read “The immortality upgrade” from The New Yorker on April 20, 2016. Read “Why I Became a Christian Transhumanist” by Micah Redding for Motherboard on Aug. 14, 2015. Listen to “What is transhumanism?” from The Christian Transhumanist Podcast on July 6, 2015. Read “Living to 120 and Beyond: Americans’ Views on Aging, Medical Advances and Radical Life Extension” from Pew Research Center on Aug. 6, 2013. Read “2045: The Year Man Becomes Immortal” from Time on Feb. 10, 2011. Read The Age of Spiritual Machines by Ray Kurzweil, which was published in 1999. Chris Bradford serves as president of the Mormon Transhumanist Association. Donald Braxton is a professor of religion at Juniata College in Huntingdon, Pa. He has planned a conference on and written about transhumanism. Lincoln Cannon helped found the Mormon Transhumanist Association and the Christian Transhumanist Association. He writes and speaks about the relationship between philosophy and technology. Christopher Key Chapple is a professor of Indic and comparative theology at Loyola Marymount University in Los Angeles. He contributed chapters on Hinduism and Jainism to the 2014 book Transhumanism and the Body: The World Religions Speak and has written on what Jainism has to offer to end-of-life health care debates. Todd Daly is an associate professor of theology and ethics at Urbana Theological Seminary in Champaign, Ill. His work on Christian bioethics includes research into transhumanism. John K. Davis is a professor of philosophy at California State University, Fullerton. He is the author of New Methuselahs: The Ethics of Life Extension. Amy Michelle DeBaets is an assistant professor of medical humanities and clinical bioethics at Oakland University in Rochester, Mich. She serves as co-chair of the American Academy of Religion’s Human Enhancement and Transhumanism Unit. Ilia Delio is a theologian and writer who is interested in the intersection of faith and science. She is a Franciscan sister. Brian Green is the director of technology ethics at the Markkula Center for Applied Ethics at Santa Clara University. He studies how emerging technologies, including artificial intelligence, affect human life. Scott Hawley is an associate professor of physics at Belmont University in Nashville, Tenn. He spoke on Christian responses to artificial intelligence at the Christian Transhumanist Association’s 2018 conference. Noreen Herzfeld is a professor of theology and computer science at St. John’s University and the College of St. Benedict in Collegeville, Minn.
James J. Hughes is the executive director of the Institute for Ethics and Emerging Technologies, as well as a bioethicist and sociologist at the University of Massachusetts Boston. Livia Kohn is a professor of religion and East Asian studies at Boston University. She researches Daoism and Chinese life extension techniques. Newton Lee is chair of the California Transhumanist Party and president of the Institute for Education, Research and Scholarships. Hamid Mavani is an associate professor of Islamic studies at Bayan Claremont Islamic Graduate School in Clarement, Calif. He has written about whether Islam is compatible with transhumanism. Gerald McKenny is a professor of Christian ethics and moral theology at the University of Notre Dame. He studies and writes about the ethics of biotechnology and the philosophy of medicine. Calvin Mercer is a professor of religious studies at East Carolina University in Greenville, N.C. He studies the religious and social implications of human enhancement. He recently told Religion News Service that Christianity and transhumanism contradict each other, since the Bible says nothing about transcending humanity. Meghan O’Gieblyn is a freelance writer. In 2017, she published an essay on how learning about transhumanism led her back to Christianity. Blaire Ostler is director of the Mormon Transhumanist Association. She speaks and writes about the relationship between her faith, feminism and transhumanism. Micah Redding is the founder and executive director of the Christian Transhumanist Association and host of the Christian Transhumanist Podcast. He has published numerous essays and articles on the relationship between religion and transhumanism. Felipe Sierra is director of the division of aging biology at the National Institute on Aging. Stephen Helms Tillery is an associate professor of bioengineering and fellow of the Lincoln Center for Applied Ethics at Arizona State University. 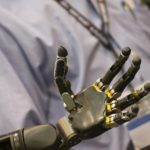 He has helped develop cutting-edge technology related to prosthetics, but he’s skeptical that science will ever produce the advancements predicted by transhumanists. Hava Tirosh-Samuelson is a professor of modern Judaism and history at Arizona State University in Tempe, where she studies Judaism and ecology, bioethics, and religion and science. Jon Bialecki is an honorary fellow with the School of Social and Political Science at the University of Edinburgh. He studies religious interest in transhumanism, with a focus on the Mormon community. Anatoli Brouchkov leads the geocryology department at Moscow State University in Russia. He recently earned international attention for injecting himself with bacteria that was 3.5 million years old in the hopes of slowing the aging process. Contact: cryology@geol.msu.ru, +7 (495) 9391281. Heup Young Kim is executive director of the Korea Forum for Science and Life in South Korea. He has written about how to apply East Asian religious teachings to the transhumanism debate. Agbolade Omowole serves as vice chair of the Christian Transhumanist Association. He lives in Nigeria. Contact: robert.song@durham.ac.uk, +44 (0) 1913343959. Tracy Trothen is an ethics professor at Queen’s University in Kingston, Ontario. She has co-edited three books on religion and transhumanism. N.T. Wright is a leading New Testament scholar and retired Anglican bishop. He is currently a professor of New Testament and early Christianity at the University of St. Andrews in Scotland. He believes transhumanism is compatible with Christian teachings on the Resurrection. Contact: ntw2@st-andrews.ac.uk, + 44 (0)1334 462827.